Hoisted on Your Own Holly? No, we won’t slow you down with this prelude each week, but since our format is new—and thanks to all who joined in last week—I want to reiterate our welcome and a quick note on how this works here at Publishing Perspectives. Feel free, as always, to leave comments for us at the column here, and consider joining us for a frank and collegial real-time exchange each Wednesday. Watch for @PubPerspectives and @Porter_Anderson on Twitter. All across the country, booksellers have a Christmas wish: that the ebook thrill is gone. There is reason to believe it will come true. eBook sales have flattened in 2013, giving publishers and bookstores hope that consumers’ appetite for print books will be renewed during the most crucial sales period of the year. But there are plenty of reasons for holiday anxiety, too, starting with a compressed shopping season, the result of Thanksgiving falling later than it has in a decade. Booksellers also have to contend with the absence of a blockbuster title to drive sales and fill stores, the way the Steve Jobs biography did two years ago. And they must compete with steep discounts on print books from Amazon. It is a grab bag of factors, any one of which could tilt the fortunes of retailers as the holiday book-buying season enters its final days. Happy holidays in the publishing community. It’s time for that annual debate about what to mull, the wine or the hemlock. @samatlounge for me the split is fairly binary: I buy ebooks for myself, print books for others as they look more impressive when wrapped. As with so many things in the industry today, complete data is in scarce supply and conflicting opinions are not. Taking too festive a stand on either side of the issue may be decking your halls with boughs of folly. To help lure customers away from using online retailers and into bricks-and-mortar shops to buy presents, Tim Morris, co-owner of Booka Bookshop in Oswestry, has dedicated his shop window to The Invisible Kingdom by Rob Ryan (Random House), with a striking fairy-light-illuminated re-creation of the kingdom framed by red curtains mimicking the book’s cover. eBook adoption is thought to be at a different point in the UK and the US, of course. And our fairy lights are just as good as their fairly lights, damn it. But Dasher, Dancer, Donder and Digital are moving so quickly across the scepter’d isle that the venerable Blackwell’s in Oxford—my personal favorite bookstore—”is attracting customers with a large Christmas tree made out of books in its shop window,” Campbell tells us, “to highlight its “Beautiful Books” marketing campaign. One thing I got right was that ebook sales would continue to rise quickly (some people back then expected a slowdown, but we were still in a more-than-doubling-each-year period though, as noted above in the predictions last year, that slowdown came eventually). I thought bookstores would be headed for very hard times. That was just before Borders’s demise. And as we stagger toward 2014, Shatzkin—en pointe for the coming January 13-15 Digital Book World Conference & Expo he chairs—is naming challenges. One of them: “The challenge for bookstores will be to stay relevant now that the most avaricious readers no longer must visit them to get their next book,” even in print, of course. But might the flight of Christmas ebooks through the snowy Whispernet this year not be quite as sassy as before? Is that what we’re saying? Or will it? Jeanette Isabella, herself, cannot bring enough torches to get adequate light on all this speculation. I don’t know if it’s a saturation point with digital. But all the data we see suggests that we’ve hit a state of equilibrium. The trend lines have flattened out. Three years ago, it was a nascent market, but now it looks like a maturing market. With two new months of trade sales data from the AAP [Association of American Publishers] released today, one recent trend is ratified: ebook sales by established trade publishers are in decline. For the approximately 1,200 publishers that report to the AAP, ebook sales have declined for 5 months in a row on a year-over-year basis. Adult ebook sales have declined for 4 months in a row. And for the first 8 months of the year, total ebook sales stand at $982 million — down from $1.04 billion a year ago. That’s Michael Cader at Publishers Lunch in eBook Sales Are In Decline (For Now), As August Marks Turnaround for Trade. That’s a November 19 report, and it references the AAP data that has “the hopes and fears of all the years” being met in one holiday season. A year previously, as the 2013 Bowker’s Demographics & Buying Behaviors Annual Review reported, ebooks were reported to be achieving “22 percent of units in 2012, up from 14 percent in 2011.” That’s how rapid a growth factor we’d become accustomed to seeing in digital. These numbers are all remarkable for a format that has experienced nothing but continuous growth up until now. And they are a little bit more remarkable still when you consider that sales have fallen in the same period in which retailers have gained back the ability to discount ebooks from all of the big agency lite publishers (who were always told that discounting would drive their sales volume). However, Cader cautions that too much wassailing by brick-and-mortar camp could be misguided. I’m going to give you some depth, a couple of info-rich paragraphs here, in which Cader deftly demonstrates how close the dynamics here seem to be. That [the AAP release of numbers for this year] does not mean ebooks have declined in significance to the trade. In that respect, actually, ebooks continue to gain — albeit slightly. Part of that is because all trade sales have declined so far this year. 2013 has been all about comparisons to the market-moving hits from a year ago, when first Hunger Games and then Fifty Shades had outsized impact on industry numbers. For the first 8 months of the year, AAP stats have trade publishing taking $201.5 million less than in 2012, down 5 percent, at $3.909 billion — but those sales are more evenly spread around, which is why many individual companies are reporting reasonable results. 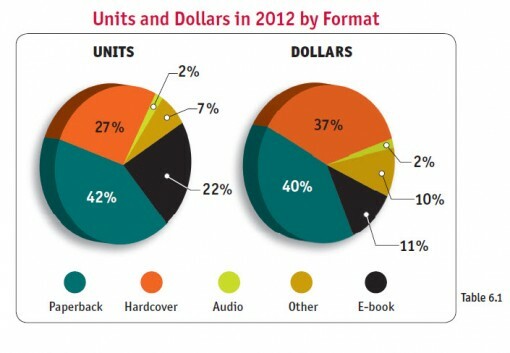 eBooks currently comprise 25 percent of sales for the year to date. A year ago, they accounted for 24.5 percent of sales. Through August they are the second-largest format for adult books, only marginally behind trade paperbacks, and could still end the year as the biggest-grossing adult format. So they now comprise 29 percent of all adult trade sales, still up slightly from 28 percent of adult sales a year ago. And finally…August ebook sales were strong. The second-biggest month of 2013 so far, and the third-largest of the past 13 months. So the recent trend may reverse itself shortly. So maybe all is not Tchaikovsky and poinsettias, after all. Bookstore owners and publishers said they were nervous about the short shopping season…Independents have also been forced to compete as Amazon recently slashed prices on some best-selling print books by 70 percent, an extreme discount even by Amazon’s standards. Concern in the publishing industry over the health of Barnes & Noble, the nation’s largest bookstore chain, has only deepened in recent months. It has come upon a midnight anything but clear this time around. And that’s where we want your help. Whilst yesterday put a dent in our stock I am glad to say that we still have PLENTY OF GORGEOUS BOOKS. How do you see the trends here at the end of 2013? Has the march of the digital toys gone into reverse this year? Or is this just a natural pause, a brief intermission before the jaws of the digital nutcracker bite down on the bookshops again? Time to back the sleigh over the e-reader? Or to load up that tablet with good literature while the prices on ebooks have readers following a star to Seattle? 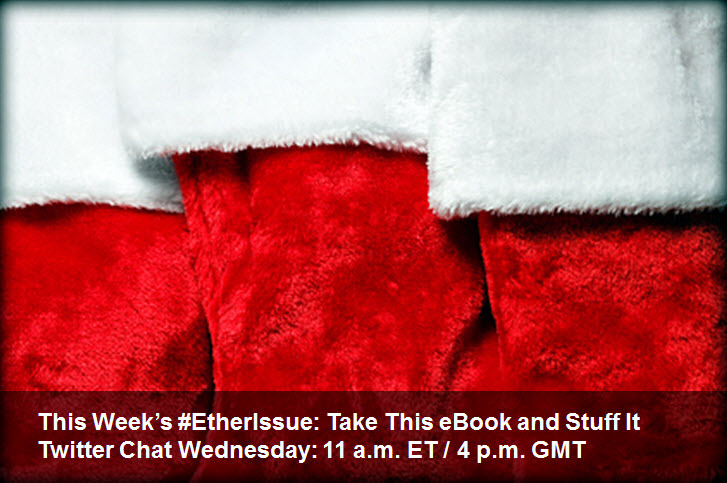 These are some of our questions, and we want yours, too: on Wednesday at 11 a.m. Eastern, 8 a.m. Pacific, 4 p.m. GMT, 5 p.m. CET on hashtag #EtherIssue — see you then. In our preparatory Issue on the Ether: Lists of Books…and Biases?, we had noted that many questions around “best book of the year” lists recalled the research performed each year by Vida: Women in Literary Arts, looking into media coverage of books. The now familiar annual Vida Count assesses how how many books by women are covered vs. how many by men—and the genders of those doing the coverage, as well. @Porter_Anderson @pubperspectives Among other things, the issue is with editors, who assign books & reviewers. And what a lively conversation we had on the issue! Publishing Perspectives readers kept Ed Nawotka and me busy with sharp, smart commentary on the question of how industry gender biases may be affecting which books get the highest visibility coverage. The issue we’d mentioned in the post about gender representation in awards came up, of course. And it was proposed that the relatively recent profusion of critical voices and outlets for reviews could have a role in the trends we see in year-end “best book” choices. Several authors who joined us spoke about criticism and other reactions to their writerly styles on the basis of gender. A robust exchange all around. Thanks to everyone who was with us, and join us again Wednesday.